The other day well I was filling up, someone was using the pump on the other side of the dispenser, and as I tried to make conversation over the top of the unit, he mentioned that he was disappointed to have got his conversion back with a spare wheel well donut - and that he intended adding a cylinder in the boot. “It just bolts in” he said. His tank was now full and that was that, but I wonder what he meant by “it just bolts in” ? So I thought I’d start covering some of the details in these articles, which no doubt will go down like a lead ballon with those installers that would prefer it to remain a black art that only they can practice ! And just to remind you (you did read the previous article on legalities didn’t you ! ), parts used should be to ECE R67.01 - I’m not going to mention this right through the article. Also, I’m not going to cover everything here so this isn’t sufficient on it’s own - if you are going to fit your own conversion (or parts) then seek advice from someone who is qualified. But this should give you a good idea of what’s needed. The Filler. Logically, this is the place to start since that’s where the gas goes in ! It should be mounted so that it will stand a 500N pull on the hose - that’s about 50kg and the force required to pull out the safety coupling on a forecourt dispenser. By far the simplest way to achieve this is to use a fitting where the manufacturer has done all the calculations, such as this one on my friends Series II/III. For use in the UK, you should ideally have a bayonet fitting, but many use a screw fitting and supply an adapter. I had a screw fitting on my old Disco (it’s just visible on the rear side panel near the petrol filler in these pics), and whilst it has the advantage of significantly reduced dimensions, it has the disadvantage of having to screw in the adapter every time you fill up - and occasionally the pump jocky would tighten it with the pump nozzle while fitting it and make it impossible to remove by hand. Make sure that if you do have a bayonet fitting, that it also has an internal thread - that way you will be able to use adapters should you need to (such as when abroad). Hint: if you don’t get the pins on the bayonet fitting horizontal (ie at 9 and 3 o’clock) then it makes it hard to use with some dispenser nozzles. GasGaurd ones are awkward, but DeVisser aren’t too bad. Pipework. Depending on your tanks, then you could have two different types of filler pipe. “Multivalve” (or “1 hole”) tanks usually use 8mm copper pipe, “4 Hole” tanks usually use reinforced flexible pipe with JIS fittings crimped on (ie just like the hydraulic pressure hoses you see on agricultural machinery). While you can get converters from one to the other, it’s simplest to just stick with what your tank requires and get a filler to suit. If your tank and/or filler pipe is inside the vehicle then you will need to provide venting to the outside. The simplest way to do this is to buy the box available to enclose your valve gear on the tank, and use 32mm vent hose. Note that a single vent hose is not large enough once a pipe has been passed through it - so on multivalve tanks it’s usual to use two vent hoses, passing the filler pipe up one, and the outlet pipe up the other, the boxes are normally arranged to make this easy - as seen here. On 4 hole tanks, there are usually separate entries in the box for filler, outlet, and vent. Here in the back of the Land Rover, you can see the vent pipes and a boot to seal the back of the filler. The tee piece is a standard 28mm copper tee (end feed, not ring feed) available from plumbers merchants - the filler passes straight through and the side branch is the vent. Note that the vent duct is secured with metal pipe clips - it is not permitted to use cable ties or glue. Pipes should be plastic covered copper pipe designed for use with LPG (though other types are specified, nearly all installations just use copper). They must be kept 100mm (4 inch in old money) from exhaust pipes, not be run through the passenger compartment, be protected from damage as far as is practical, be kept away from jacking points, and fixed at no more than 600mm (2 foot) intervals. Fixings must be with purpose designed pipe clips, and plastic strapping or ties is not permitted. It should also be positioned where it is visible for periodic inspection. Do not use any more joints than are necessary for the fittings & equipment used, joints should be flared or compression joints with a brass olive. For a copper fill pipe, 8mm is normally used. 6mm is normally used for the supply pipe, but in high demand applications (ie several hundred horsepower) either two 6mm pipes (from two tanks) or an 8mm pipe is used. Tanks. Well there’s big ones, little ones, long ones, short ones, cylinders, toroidal (doughnut), filled centre toroidal (doughnut with the middle filled), and even specialist tanks such as a vertical toroidal designed to replace the spare wheel in the back of Range Rover - the only common factor is that they are not square ! They are generally designed for one of two types of valving - “4 Hole” or “Single Hole”. 4 hole tanks simply have 4 separate holes to take separate fittings (filler valve, outlet valve, level indicator, and pressure relief valve). Single hole tanks, as you might have guessed, have only a single hole into which is fitted a multi-function valve - the tank shown in the photos above is a single hole tank (made by Stako) fitted with an Emer valve set and vapour box. Confusingly, the multi function valve is called a multivalve - so 4 hole tanks have multiple single valves, single hole tanks have a single multivalve. 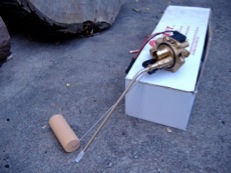 To the left is a multivalve before fitting to a tank - the small tube is the liquid pickup (with a small strainer on the end) and next to it is a float on an arm that is used for both the level indicator and the fill shut off valve. The Emer valve pictured here contains (as well as the functions mentioned above) a manual shutoff for both the fill and outlet (the small yellow lever), a non return valve in the outlet, and a fusible plug to release the gas in a controlled manner in the event of a fire. Part of the course involved a walk round the warehouse to see the range of items available - the smallest is about 6l (to fit in the helmet box of a scooter ! ), and they go all the way up to 200l and above. This is usually the hardest part of any conversion, deciding on the ‘right’ compromise between cost, space, weight, and capacity of the tank(s). As you might have seen from some of the pictures on this site, older Land Rovers (and other large vehicles like them) have some useful options for tanks underneath, but in the case of most cars (and newer Land Rovers where there are all sorts of bits such as air suspension compressors stuck underneath) you are more limited and it can often come down to “spare wheel well” or “cylinder in the boot”. Cost wise, cylinders are the cheapest by quite a margin, followed by open toroidal, closed toroidal, and specialist tanks. Single hole tanks, and the valves for them, are generally slightly cheaper than 4 hole tanks and valves. When considering the space available, don’t forget to allow for the valves and pipework. Cylinders have the valve on the outside as in the photos above - you can get an idea of the size as the tank is 80l capacity, 360mm diameter, and 892mm long. On a 4 hole tank, the optional valve box will approximately make up a square corner on a 360mm dia tank - ie if you were to draw a 360mm circle in a 360mm square, the valve box would fill one of the corner spaces. On an open toroidal, the valve is inside the hole in the middle, so the quoted size of the tank is all you need. On a filled centre toroidal, the valve sticks out quite a way on one side (it’s not actually visible in these pictures, but it’s between the tank and the towbar on my 110). Once you’ve chosen your tanks, it’s time to mount them. You have several options available and it largely depends on what your requirements are. 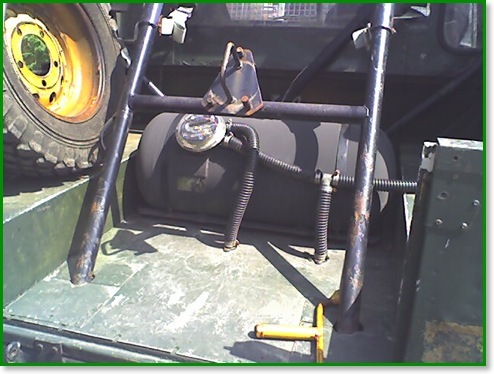 For a “cylinder in the boot” job with the tank mounted across the vehicle, the simplest method may be to use the manufacturers mounting frame (as in the top picture above) - you just bolt it down with 4 to 8 bolts (as specified in the manufacturers instructions) and large washers or spreader plates underneath, strap the tank to it, and that’s it. The manufacturer has taken care of the calculations and you can be reasonably confident that it’s going to stay put. I have seen the frame welded in, but that was in a Range Rover with an aluminium floor - so although there were numerous beads of very neat welding, only the one in the extreme corner (where the floor is steel) was actually attached to anything, so I don’t think that was going to take 20G ! If the floor isn’t flat enough for that, you can use “cheat bars” which are telescopic bars with a mounting flange on each end. Just bolt them in between the wheel arches or whatever structure is in there, and strap the tank to them. Other tanks frequently have preferred mounting methods - for example the 66l toroidal under the back of my 110 has mounting brackets on the top, and mounting frames are available for other toroidal tanks. For underslung tanks you can use brackets or straps, on my 110 I’ve welded substantial brackets to the chassis for the 36l cylinder under the drivers side. If you use brackets then you need two, if you use straps then you need three (to allow for one of them getting damaged). Unless the tank is physically protected, it should not be lower than either the original load bearing structure or 200mm (8 inch). Tanks should be mounted to withstand 20G acceleration in the direction of travel, and 8G horizontally at right angles to direction of travel. 20G is quite a large factor, it means that the mounting is expected to withstand a force 20 times the weight of the tank, or well over a ton for the tank in the pictures above ! It’s commonsense really, but you don’t want the tank coming loose in an accident. Straps, brackets, cradles etc should have plastic or rubber protection to prevent fretting and corrosion of the tank - the straps supplied with Stako cradles are plastic coated to take care of this. There is a specified standard for straps, but yet again, either just use ones sold for the purpose or read up and get the full spec. Tanks should be protected from impact, and should not be outside the plan of the vehicle unless protected. You can mount them on the roof, there are specific rules for it. However, I would not in general recommend it because of the weight. Next time I’ll move forwards and cover the stuff under the bonnet.